ANN ARBOR, Michigan, October 14, 2013 (ENS) – The first-year results of a University of Michigan sustainability awareness and behaviors evaluation released today shows that while students, faculty and staff care about sustainability on campus, there is much room for improvement. The program is tracking the “sustainability culture” on the university’s Ann Arbor campus over a six-year period, with particular focus on four campus sustainability goal areas: climate action, waste prevention, healthy environments and community awareness. The Sustainability Cultural Indicators Program, known as SCIP, is a first-of-its-kind study by the Graham Sustainability Institute at the university and the Institute for Social Research, also at the university, which includes five separate, interdependent research centers. “The university is committed to ambitious sustainability goals – one of which is to pursue evaluation strategies toward a campus-wide ethic of sustainability,” said John Callewaert, director of integrated assessment at the Graham Sustainability Institute and co-principal investigator of the SCIP project with Robert Marans, research professor at the Institute for Social Research. A year ago SCIP surveyed more than 6,600 students, faculty and staff about their sustainability knowledge, beliefs and behaviors. The first-year report, titled “Monitoring the Culture of Sustainability at the University of Michigan: Fall 2012,” represents the tabulated results of that survey. — The behaviors of students are far more in tune with the goal of greenhouse gas reduction than the behaviors of staff and faculty due to differences in the ways each group travels to and from campus. Students are likely to know more about transportation options available to them and are more engaged than either staff or faculty in sustainability activities on campus. — Compared to students and staff, faculty tend to act in a more sustainable manner on conserving energy, preventing waste, purchasing food and engaging in pro-environment activities outside the university. — Students tend to be less knowledgeable than staff or faculty about protecting the environment, preventing waste and sustainable foods. But they are more aware than faculty about what is happening at the university with regard to sustainability. 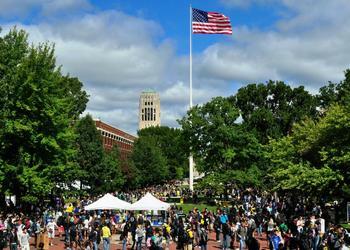 Members of the staff are most aware of the range of U-M sustainability initiatives. Marans says index scores from the first-year survey are crucial because they serve as benchmarks against which findings in future years will be compared, with 15 specific sustainability cultural indicators to be monitored annually. Indicators cover awareness, dispositions and actions related to travel and transportation, waste prevention, conservation, the natural environment, climate, food and engagement. 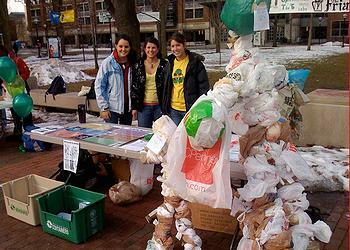 They also cover awareness and ratings of campus sustainability initiatives. Survey data are supplemented with geographic data covering campus buildings where respondents live, work and study. The second annual survey will be distributed to a new sample of students, faculty and staff this month.